Everyone knows that every single casino game is based on odds. That's why smart seasoned gamblers take the time to thoroughly understand the math and odds behind each game. Gambling is not purely based on luck. While it's true that luck plays a gigantic role in winning when it comes to gambling, strategy is also important. Implementing a good tried-and-true strategy maximises your chances of winning. The key to coming up with a good strategy is to understand and calculate the odds. If you don't understand the odds, you might as well be playing the game with a blindfold on. To understand the odds is to understand the game thoroughly. 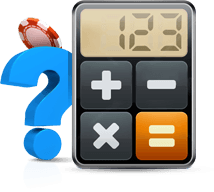 You don't have to be a mathematician to understand and calculate the odds of a casino game. 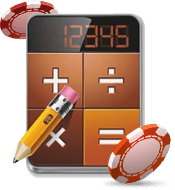 Here's a basic guide to calculating the odds and selecting the best casino bets. There are two different kinds of odds you should take into account: the odds of you winning, and the payout odds. This is the likelihood of your bet winning. For example, the standard single zero roulette wheel has 37 numbers: 1-36 and a single zero. If you bet on one straight up number, your winning odds is 1 to 37 (the chance the ball will land on your number against the chance of it landing on all of the possible numbers). The payout odds determine how much money you'll receive if you win the bet. Let's talk about roulette again. Like we discussed before, the winning odds of a straight up number in roulette is 1 to 37. When it comes to payout odds, it's only 35 to 1 (you win $35 for every $1 straight up number bet). It's to give the casino a house edge (more on this later). Some casinos will list the payout odds on the layout (like the craps table or in slot machines). You need to be careful, though. There's a big difference between payout odds expressed in the form of "to" (like 3 to 1) and payout odds expressed in the form of "for" (like 3 for 1). If the odds are expressed in the form of "to", that means you'll win the former number and the latter number. For example, winning a 3-to-1 bet means you'll get 3 chips and keep the original 1 chip bet. If the odds are expressed in the form of "for", that means you'll only win the former number and lose the original bet. For example, winning a 3-for-1 bet means you'll get 3 chips but the casino keeps the original 1 chip bet. Basically, a 3 for 1 payoff is actually the same as a 2 to 1 payoff. So you should always pay close attention to the way the casino phrases the payout odds. If you have to choose between a 3-to-1 bet and a 3-for-1 bet, pick the 3-to-1 bet. You'll be better off placing a bet that pays 3 to 1 instead of a bet that pays 3 for 1. One of the reasons that casinos make so much money is that the house always has an edge - in a meta sort of sense, the casino is betting on the fact that a large enough majority of players don't understand how that edge works and that they just see playing games as pure luck. However, with a better understanding of the games, a player&apos;s edge can increase. Online casinos typically offer better payouts and have a significantly lower house edge than real world casinos. To get a better idea about odds, you can take a look below for information about specific games found at casinos. Blackjack occupies a pretty interesting place in terms of casino odds because, if you know what you're doing, you can significantly reduce the house edge. The tricky part is that you'll have to use strategy in order to do very well. Most players will make decisions based on probability and are not concerned on just one hand, but the big picture. Typically, casino video poker offers about a .46% house edge, but this can be improved if you play online video poker. Jacks or Better is the ideal game to play in a casino situation, but you should also check out the different variants of it that are available online in order to get the best odds. Online baccarat is an incredibly simple game - all you have to do is bet on either the banker or the player. Then, both sides draw cards and the side closest to nine wins. In online baccarat, the house edge for the banker is actually negative, although they add a small tax to betting on the banker, which means that it comes out in the house's favour still, but the edge remains very small. Craps is another game with a very low house edge, even in real life casinos. Online, of course, this improves even more. The one thing to remember about playing or betting on craps is to always put your money down on 'pass line' which gives you the best odds of winning.